The U.S. Geological Survey (USGS) found a 2,000 year old black coral in the Gulf of Mexico. The black coral (class Anthoza, order Antipatharia) was found on Wed March 30th, 2011, near the infamous BP oil well. This was the first time scientists have been able to validate this deep-sea coral’s age. The black coral thrives in water that is 984 feet and deeper, yet they are significantly influenced by what happens on both the ocean surface and floor. It’s amazing to think that a coral can live for over 2,000 years (not in my tank, of course). The combination of age dating with a new skeletal sampling laser allowed scientists to reconstruct environmental conditions in segments smaller than a decade over the last 1,000 to 2,000 years. 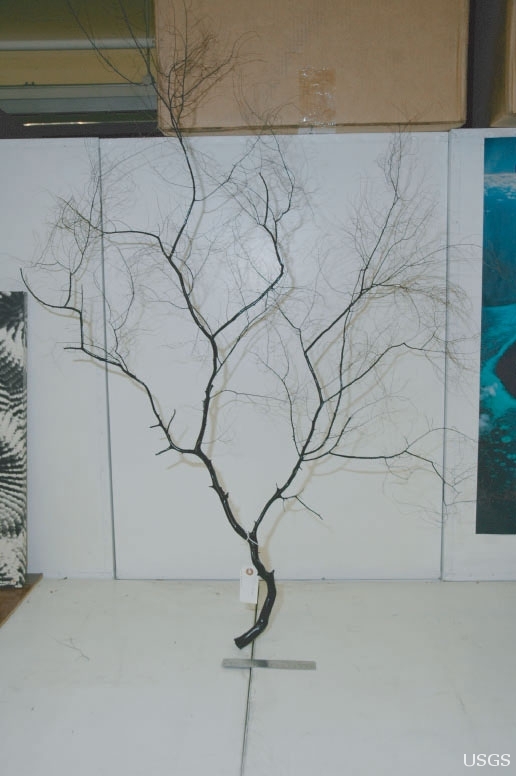 The black coral grows in a tree, or bush-like form, and are the slowest growing deep-sea corals. These corals grow between 8 and 22 micrometers per year (so stop complaining about your chalices!!). Black corals get their food from sinking organic matter, rather than symbiotic algae, which means that they must construct skeletons that are flexible, yet strong enough to endure the significant flow which carries food.